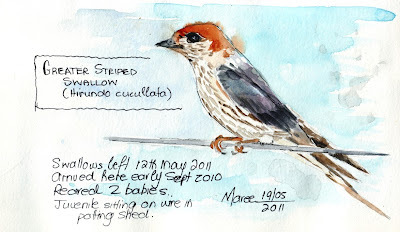 My Swallows were late in leaving this year, still saw them around just a week ago. Now their twitterings that I love to listen to as they swoop over my garden or sit on my Satellite dish are silent. They returned to their old home in the pump house in early September 2010 and I'm always humbled and honoured to think that they choose to return to me after thousands of miles of travelling. They managed to rear two babies this season and it was a delight watching the parents teaching them all the sweeping moves over our vast expanse of grassland and it wasn't long until they too were balancing on the wires strung up in my (open-air) potting shed, which I use to hang flowers for drying, happily calling to one another. It's always a worry to me, wondering whether the babies will make the long journey safely. And it's always only the parents returning every year (for the past 5 years now), so I often wonder where the babies head off to...? If our summer is exceptionally hot or dry, I leave the hosepipe dripping on an empty piece of ground in the garden and have spent hours watching them gather mud for their nest-building. Some info : The Greater Striped Swallow (Hirundo cucullata syn. Cecropis cucullata) is a large swallow. It breeds in Southern Africa, mainly in South Africa, Namibia and southern Zimbabwe. It is migratory, wintering further north in Angola, Tanzania and southern Zaire. The Greater Striped Swallow builds a bowl-shaped mud nest with a tubular entrance on the underside of a suitable structure. The nest has a soft lining, and is often reused in later years. It is common, unafraid of humans, and has benefited from the availability of nest sites around habitation. It feeds mainly on flying insects, but has been known to eat small fruits. It's conservation status is LC (Least Concern).